We're pretty sure evolution is not, and never has been, headed in a specific direction: it’s not a process for generating any particular species or trait. The question is: Is evolution headed in a general direction -- toward increased complexity, whatever form that complexity may take? If the evolution story is to function as our creation myth – that is, the story about how we got here that situates our spirits and awakens awe and gratitude – then we need to explore this question. 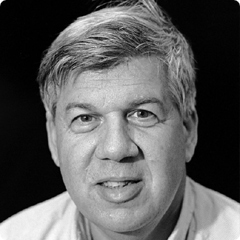 The late paleontologist Stephen Jay Gould (1941 - 2002) was the most prominent science writer to argue that no, evolution has no direction to it. He raised some good points. Evolution is not a story of progress, he said, it is only a story of constantly shifting adaptation. He didn’t just mean that a species like homo sapiens would be unlikely – a species five or six feet tall with armpits, bad jokes, musical instruments, and all the rest. Gould meant that “the chances of getting any species smart enough to reflect on itself are ‘extremely small’.” (Robert Wright, Nonzero, 267). On Gould’s picture of the basic principles of life, yes, the outer envelope of organic complexity may tend to rise – “the most complex creature may increase in elaboration through time.” But there’s no built-in drive toward complexity. Exhibit A for Gould’s argument is that there actually are some species that have gotten less complex through evolution. If the costs of maintaining a complex feature become greater than the advantages, selection will tend toward the loss of that feature. For example, species that have moved into environments of total darkness have gradually lost complexity in their eyes and optic nerves, sometimes without any increased complexity in other ways. completely covered by a layer of skin. Gould's exhibit B is that “Bacteria showed up billions of years ago, and there’s a lot of them still around, evincing no aspiration to climb higher on the tree of life” (Wright 267). Modal complexity – that is, the level of complexity at which the greatest number of living things resides – the mode – shows no tendency to grow. None. The most plentiful life form on the planet, both numerically and in sheer pounds, is just as simple now as it was two billion years ago. That’s a good point, too. And one to remember in our spiritual moments of awe at the wonder of life. Thus, concluded Gould, there is no built-in tendency toward complexity. For Gould, when complexity emerges, this is a matter of random variability. And even when it does happen, there’s no guarantee that a shift in the environment might not exert evolutionary pressure on that species for reduced complexity. Although it is rare, sometimes dumbing down improves odds of reproductive success. For some reason, whenever I say that dumbing down can sometimes improve reproductive success, many people find themselves remembering being in high school. Was Gould right that there is no direction for evolution? Species change, and there’s no general characterization of the overall tendency of that change? Next: Why Gould was wrong. This is part 4 of 7 of "Eschatology: Evolution's Arrow"
Next: Part 5: "Of Arms and the Man I Sing"
Previous: Part 3: "Flukes of the Universe"